Today is Debbie’s birthday. 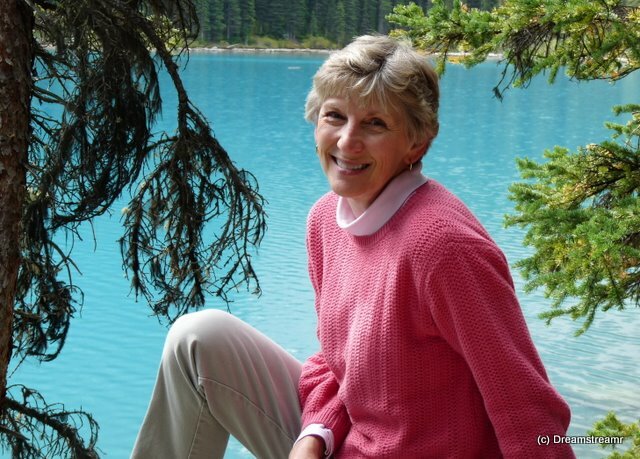 We are probably celebrating her birthday in Yoho National Park, British Columbia. Jim posted this ahead of time for automatic release today because we expect we may be without internet connections for the week and possibly longer. We’ll have presents for Debbie and celebrate with brownies and ice cream. She’ll receive her birthday cards through our mail forwarding address (Livingston, TX) when we arrive at Kelsey’s in Vancouver in two weeks. Jim climbed up and washed off the solar panels and skylight yesterday, and checked connections on the rooftop hf antenna. He puttered around awhile with stuff in the back of the truck. While we were reading outside enjoying the beautiful day, a big yellow Bluebird school bus pulled into the site beside us. From within spill out five folks from Quebec, and only one of them speaks English well. The one who speaks the best English had been hitchhiking and the good folks in the Bluebird, Martin and Magalie, gave him a ride in. The hitchhiker donned his pack and walked over to the tent campground. Martin showed us his turbo hose had blown off while they were pulling a hill yesterday. The noise was like an explosion so they thought they had popped a tire. Jim offered him two large radiator hose clamps from our parts box to try and make the repair. An hour later Martin and Magalie walk over with a bottle of vin blanc, from a fine wine region in south Quebec, to thank us for helping them with their diesel engine’s hose. They also want to show us their rolling home. They paid $2,000 for it and spent another several thousand converting it to their camper. It has four bunks, space in the rear for a queen-size bed (they currently use the space for clothes and gear storage), a nice kitchen and dinette, two sofas, a six cf fridge, and a bathtub under one of the dinette benches. Martin installed a floating wood floor throughout, and it looks really nice. The bus is approx 12 or 13 meters long and seems very spacious inside. Jim asked them about water, heat and electricity. Magalie responded they do not have a water reserve tank, and Martin showed Jim the five gallon drinking water bucket they keep on-board. They have a porta-potti in the rear, have a small electric space-heater, and do not have any water heat. What they have is a spacious and very nicely layed-out home which, if they want, they can improve as time passes. Or they can use it, as is, for a very nice hard-sided camper anywhere they want to take it. Pretty nice! Magalie says it is loud and a little hot and bumpy but they are young so it is okay. They are on their way to Vancouver Island to work through the winter. They are both teachers and apparently have jobs already in Courtenay. Then they might travel south and around the States. We enjoyed meeting this very nice couple and wish we were able to speak a little French to talk better with them. They are on a neat journey and we like how they’re doing it. There’s much more story here, but they left this morning after their hike up to Lake Louise. They did the hike in an hour each way, less than half our time. I hiked so easily twenty years ago, I think. I don’t remember. What’s a visit to Banff Park without going to Banff? Last night’s low temperature was 4C (39F). This morning was crisp and clear, a great day for a drive. Our drive today was along Bow River Parkway, the original Park road route and very scenic, to Banff village. Along the way we had numerous opportunities for exhibits and overlooks. 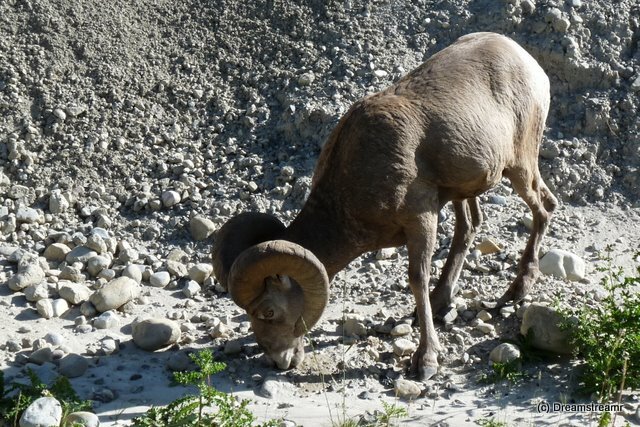 Once we were within five feet of a small group of Rocky Mountain Bighorn Sheep. The sheep were grazing on the shoulder beside the road, ignoring us completely. As they should! We stopped and read a small exhibit about the WW1 Internment Camp in Castle, where a large number of predominantly Ukrainian-origin men were housed. This was not a terribly hospitable place for them, and was a terrible injustice. Not that America did any better two decades later with Japanese Americans and other groups. 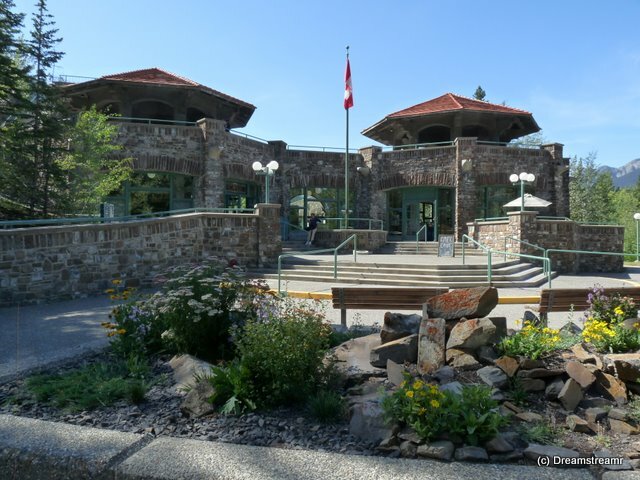 Our first stop in Banff was the Banff Park Museum. The museum was conceived in 1895 and temporarily housed in an adapted house while the permanent location was built. 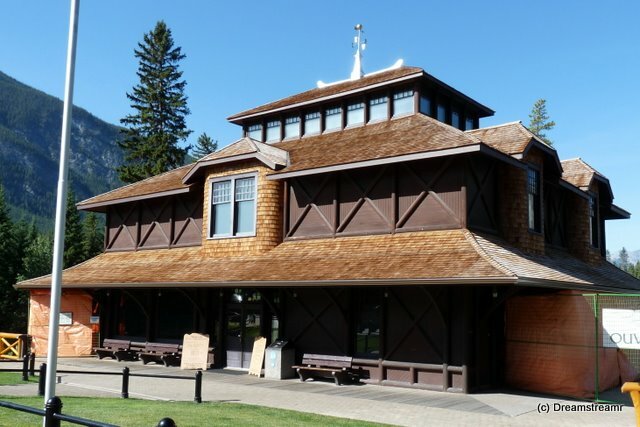 The Banff Park Museum has been housed in its current home for 106 years, and is very compact but not crowded inside. 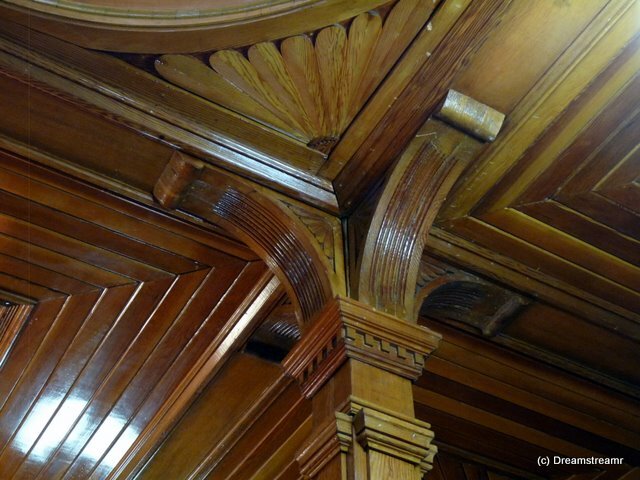 The building’s interior is Douglas fir throughout, and the carved and hand-molded trimwork is absolutely lovely. We walked from the museum to the main street and stopped for a cup of coffee and the biggest cranberry oatmeal cookie you ever saw. It was less a cookie and more like a flattened muffin. This served as lunch and provided us a great place to sit and read today’s news. Fortunately someone had left today’s Calgary paper, all sections. We slowly finished our coffee and “muffin” and shopped a little. Our three hour parking place was expiring. We hopped into the truck and drove to the Cave and Basin National Historic Site, just two kilometers from downtown (nothing is far from here). 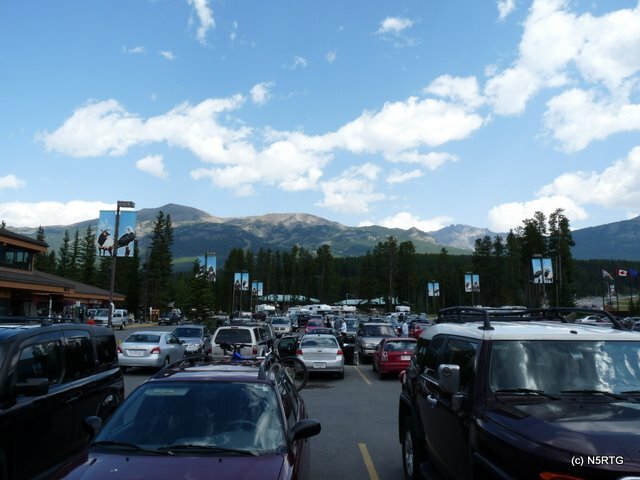 The parking lots for the Cave and Basin are tremendous, and we didn’t count more than a dozen cars or pickup trucks parked. It is difficult to imagine over a thousand people thronging the exhibits and walkways, and we’re glad we picked a light day for our touring. Our favorite part may have been the 30 minute video shown in the nice theater, a replica of the 1887 bathhouse. 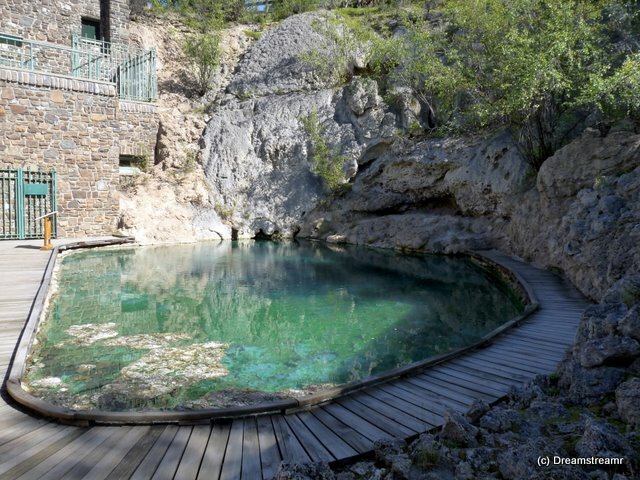 The movie depicted the 1883 discovery of Banff’s hot springs by the McCardell Brothers and Frank McCabe. It explains the rapid popularization of the springs, conflicting land claims, and the eventual dominion by Canada. The result is the beginning of the world’s largest national park system. The video was nicely done, entertaining and interesting. No less interesting are the exhibits and self-guided tour around the springs up the hill from the bath house and tea house. We saw the cave opening, as depicted in the video, and could just imagine the three young men building their small log cabin nearby. And we saw the original bathing basin as well as the long pool, added in 1902. Throughout the entire visit the smell of the sulphur-scented spring water was pervasive. It reminded Jim of our visit to the geysers in Yellowstone — very same smell, without the eruptions. The springs at Cave and Basin only gurgle and flow downhill. We drove to the National Historic Site of the Banff Springs Hotel. This is an unimaginably tremendous building, larger than any we saw last year in Glacier National Park in Montana or in Waterton, Alberta. We were sort of expecting another of the really pretty and rustic 1890’s railway hotels. Not here! 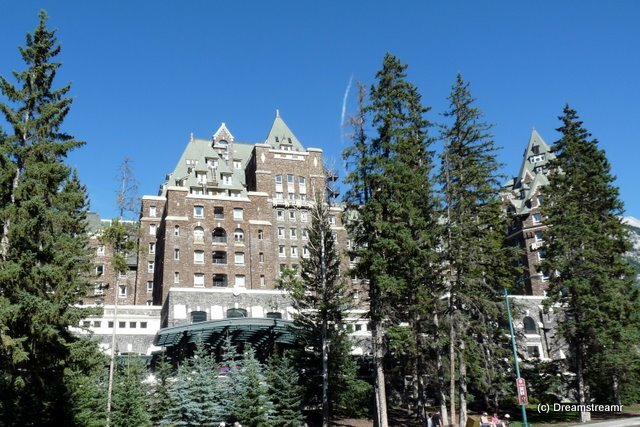 The Banff Springs Hotel seems more on the order of the Grove Park Inn, perhaps even with a little more polish. Unfortunately it appears some of the original charm is gone from Banff Springs Hotel with the year 2000 additions to the front and sides. We had difficulty imagining just how it looked then, and this may suit the current owner and managing company just fine. They do not seem to be selling nostalgia as much as “resort hotel”. 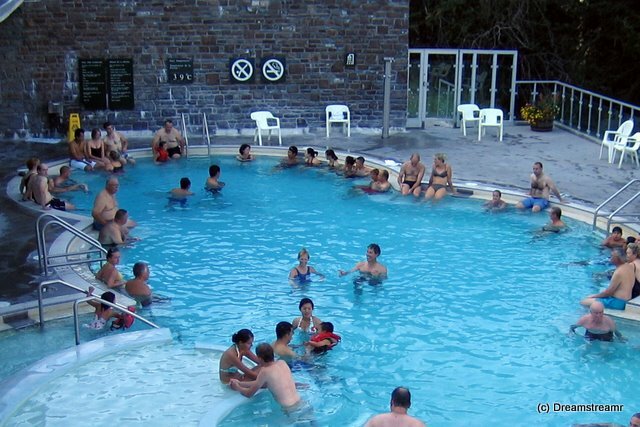 Now it’s our time for a nice hot soak at the Banff Upper Hot Springs. We have carried our swim suits and towels in the truck, hoping we would be able to take advantage of this. We enjoyed a relaxing half-hour in the 39C (102F) water. While we thought the water could have been warmer by a few degrees the 39C is both safer for many of the bathers and still plenty to warm and relax us. The bath house, locker roooms, and soaking pool are well-organized and operated and it was very pleasant. We showered, dressed, thoroughly warmed, and drove back down the hill to again. It was more difficult to find a place to park the truck. We finally found free three-hour curbside parking beside Safeway food store. By now it is after six o’clock p.m. and we didn’t really have lunch. A short walk to the center of town and we found an okay diner/pub upstairs over the coffee shop we’d patronized earlier today. We enjoyed a nice dinner of ribs and fish and chips downtown at The Elk and Oarsman Pub and Grill, then decided to split up and tackle two important jobs. Debbie took the most important job — she picked up the groceries at Safeway. Jim walked to Starbucks with the laptop and one of the portable ham radios. He answered a few emails and updated our blog. When Debbie called him from the truck, Jim wrapped up the laptop stuff and met her as she drove up outside Starbucks. It was a fantastic, if long, day. We arrived back home just before ten o’clock p.m. Our campground’s signs say “Full”. We wonder if, like us, everyone arrives Thursday evening for the weekend? Most people we’ve met or noticed haven’t stayed more than a couple of days, though. Every site we drove by was full except the one beside us. Not a problem for us — the last people were in late and left before we awoke. We unpacked the truck and put clothes and groceries away. While Debbie repackaged some of the food to fit into our fridge and pantry, Jim cropped and edited pictures and updated our journal. Probably because of the Starbucks coffee, at 0145 the next morning, Jim was still going strong. Oh well, we’re behind on journalling and this stuff needed doing anyway. Wednesday dawned another bright sunny day and we got an earlier start than most days to beat the crowds to Moraine Lake. We enjoyed the beautiful drive up to the lake with fantastic views of Panorama Ridge and several 10,000+ foot peaks. We arrived just after 10:00 and found the parking lot full. But we managed to squeeze in at the end of a row. We walked the trail around the lake and took in beautiful views of the blue green water. No matter how many of these glacier-fed lakes we visit, we’re still amazed at the color and clarity of the water. Even though the parking lot was full, the trail was not too crowded. Returning to the parking lot, we found that four more cars had parked beyond us and the sides of the approach road had filled with vehicles – a very popular place for a Wednesday morning. We returned to the campground and made a picnic lunch for our drive north on the Icefields Parkway. 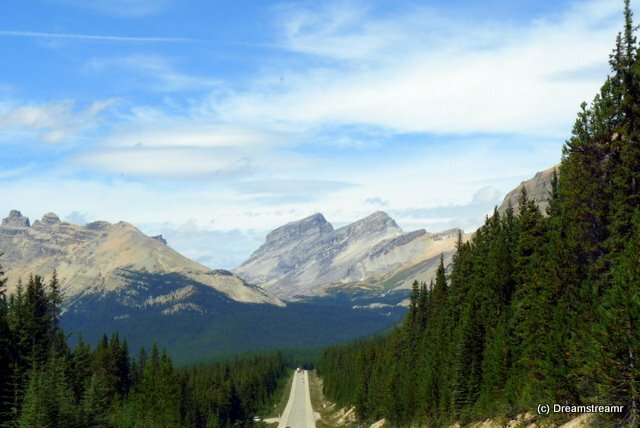 This road takes you to Jasper National Park with lookouts and trails to numerous glaciers. We didn’t want to drive the entire 230km (138 mi) but did want to get a taste of the Icefields Parkway. It was a picture-postcard day for driving. 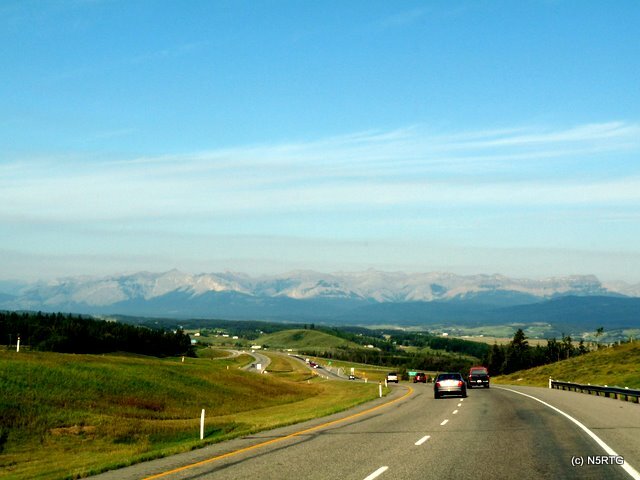 Everywhere we looked along the drive offered breathtaking views of the Bow River, glacier lakes, mountain ridges and peaks. We stopped at several turnouts for a better view and to take pictures. At Bow Lake we decided to look for a picnic spot. We parked and headed for the trail to the lake. At the lake, we wandered along the shore instead of taking the trail until we found a spot to sit and eat. 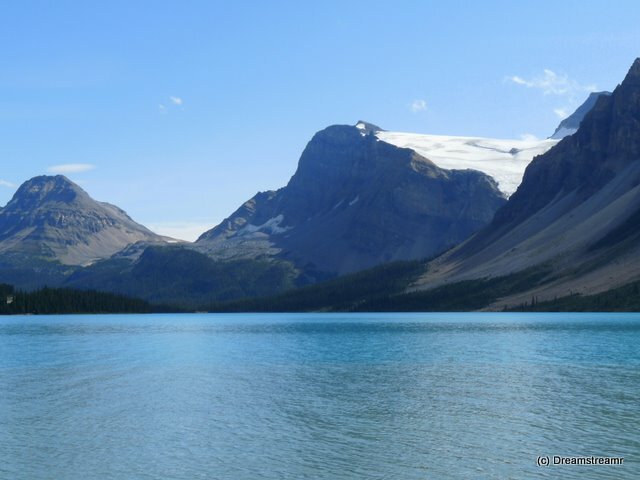 From there we had views of the Bow and Crowfoot glaciers, Bow Lake and the Bow Falls. After our picnic, we returned to the trail and found our way to the Num-ti-jah Lodge, a very rustic lodge built in the 1890s with only a sketch in the sand for a plan. It is completely off the grid like Mary’s McKinley View Lodge that we visited in Alaska. They have generators for all their power. We toured the lobby and gift shop before returning to the parkway. As it was getting late, we decided to head back south to Lake Louise Village and campgrounds and save the rest of the Icefields Parkway for another trip. We read, while camping in Winnipeg a couple of weeks ago, reports of black bears outsmarting the “bear-proof” canisters for backpacker food. The former design included a large screw thread in the lid with a recessed spring-loaded release button. The new design has two release buttons and the bears reportedly are still defeating the interlocks. We’re not in a tent and so are exempt from having our food in these canisters. Last night’s low temperature was 37.9F (3.3C). This morning is bright, full sunshine, and no clouds. Jim’s up early, before 0900 hours, to turn up the heater from 50F (4C) to all it can do, and to make a pot of tea. An hour later the RV is up to 57F (14.1C) and Deb is sitting up, peering out the window. Again, we slept great and only know a train went by because we were already stirring at that time. Then nothing heard until we arose. On the other hand, Neal and Michelle from Sequim, WA, pulled out this morning, a day early. Their spaniel couldn’t tolerate the trains passing by. Each time a train passed by the campground, all night and day, the spaniel pranced, moaned, and barked. And it just wasn’t worth it for those folks, so they’ll find a better place for the whole family today. Gee, doesn’t it make us wish we had a pet dog? Les and Sharon left this morning headed for the Ice Fields and on to Jasper. Today is an in-camp day. We overdid our walk a little yesterday, so decided to relax and enjoy incomparable weather and mess around here today. We refilled one of our two 30# propane cylinders, putting 27 liters (or 7 gallons) into it for $28 Canadian. Since there is full electrical service and nice showers, we are only using propane for cooking. Our next several campgrounds, however, will likely be without any services. So heat, cooking, and water heating will all be from our propane. We leave here next week with two full cylinders. Several days ago we were pouring over the various propane fittings at Bucars RV in Calgary. The precise fitting we need eluded us. We want to connect our gas grill’s included hose to the trailer’s gas plumbing. 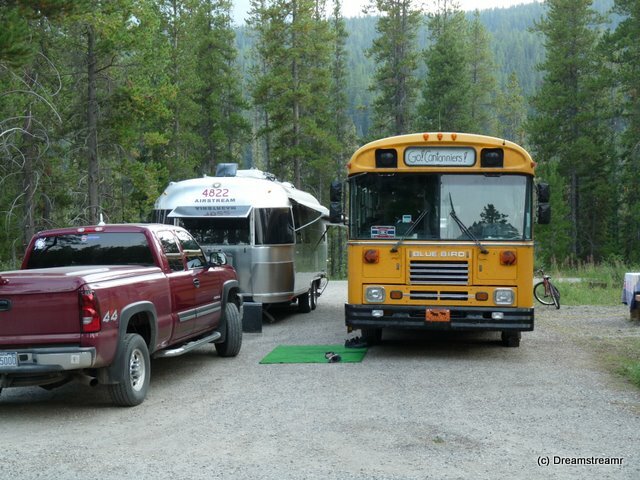 Some RVs include a quick-connect propane fitting under the RV’s curb side. Hey, if the RV manufacturer is including them, these little things must not cost much. But the store at Bucars didn’t include what we thought we needed or, at least, not for an amount we were willing to pay. We receive a two to five percent discount from our credit card rebate plus the dollar exchange rate. Still, prices at an RV store seemed high for these accessories. We figured we would wait until we return to the States to look for these parts. We brought several one pound propane cans with us for the gas grill, so we might not need to purchase these in Canada. We are seeing these propane cans for up to twice the price we found them in the States. Today Jim stood outside the RV staring into the large propane bottle enclosure. When Deb joined him, they discussed a scheme to connect the grill’s propane hose to one of the large propane cylinders. It turns out to be too simple. We disconnected one of the RV’s two bottle hoses, and connected the grill’s hose to the now unencumbered cylinder. Voila! We can place the grill on our portable table up to fifteen feet away from the RV’s propane bottles. The hose remains connected to one large cylinder. Just before turning off the grill we will close the cylinder valve and let the hose depressurize into the grill’s burner. We will coil the hose around the large propane bottles inside the RV’s bottle enclosure before we travel. The cylinder remains closed (off) at all times except when we are grilling. We plan to serve the RV with one thirty-pound cylinder, and when the primary cylinder runs below 1/8 we will swap the grill hose to the depleted cylinder and refill it when convenient. This little exercise avoided paying up to $80 Canadian for a 5 or 10 pound cylinder, or $100 for a tee-fitting, or $60 for the least expensive adapter we could find. We had everything we need, but hadn’t put on our thinking cap. Let’s try this solution awhile and see how it works out. Speaking of a little exercise, we walked the LL tent campground today. It seems prettier than the trailer one but has limited spaces for trailers. The sites are definitely nicer looking. The cost is a little less, and there is not electricity at the sits. Oh, one more little thing. 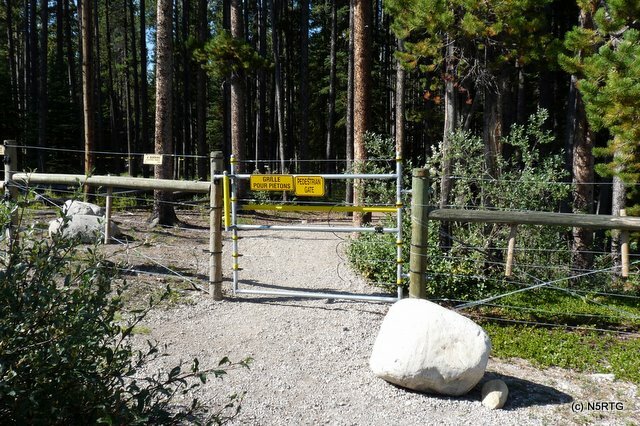 The entire campground is surrounded by bear-proof five feet tall electric fencing. It is really hard to believe the bears haven’t figured out the gates. If the bears can defeat double release buttons to unscrew the food canister lid, it’s — just a matter of time, clearly. The low outside temperature last night was 38 degrees Farenheit. This is the coldest we’ve seen in summertime Canada but no surprise for over 5,000 feet above sea level. We slept warm by keeping the RV to 49 degrees with a little ceramic heater. In another week we are camping without hookups in Yoho National Park and, if it is cold outside, we will be adding another blanket on the bed. Last night the trains didn’t awaken us. We only heard the trains passing by if we were already awake. Deb awoke sometime during the night and found the refrigerator was 30 F. She left the fridge door open a few minutes and turned the fridge off. When we finally got out of bed, the fridge was still 33. We might not turn it on until this afternoon sometime, and will not leave it on when we go to bed. Not too tricky, just one more non-automatic thing to manage. Our milk is occasionally laced with ice flakes. We’ve lost some lettuce, but not all of it. My first camper had a very tiny refrigerator. It was a 1970 a VW Westfalia and had an icebox under the sink. The icebox was cooled with, you guessed it, a block of ice on the top tray. The icebox kept things sort of cool and nothing cold. So our current situation is not really so bad. After five hours hiking today we returned to the RV and found the refrigerator, although turned off the entire time, still shows 38 F degrees. Wow! 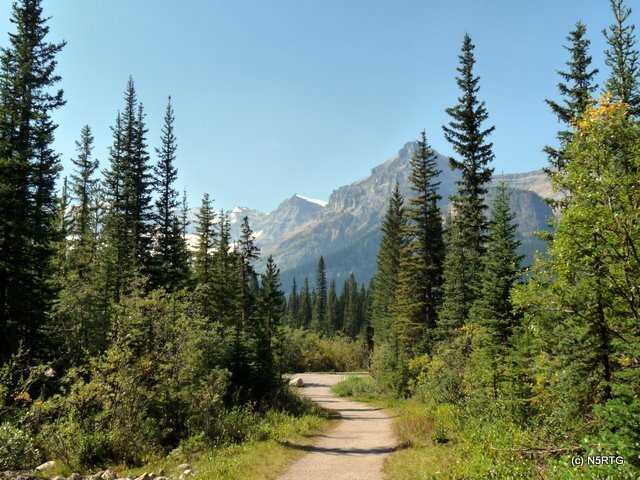 We hiked along Bow River Trail to The Station Restaurant, then up Tramline trail to Louise Creek trail to Lake Louise Lakeshore trail. Each trail has clear temporary signage warning of current bear activity in this trail’s area. We saw no bears and don’t half mind. 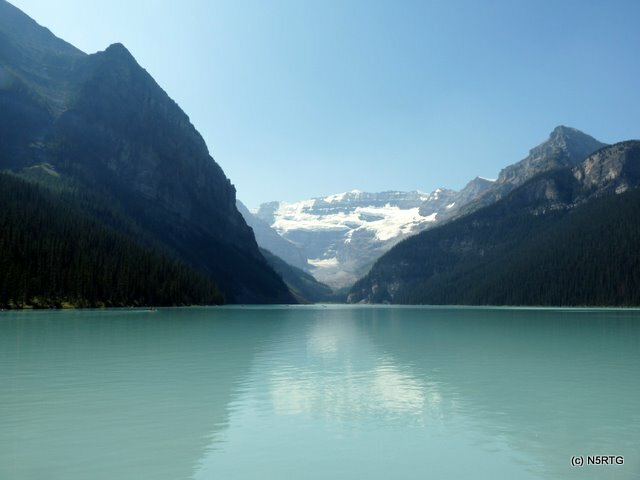 The Lake Louise water is clear and an incredible aquamarine color. We were able to take several good pictures of the lake. The best pictures do not include Chateau Lake Louise, in our opinion. Our ascent was almost 700 feet from the our RV site to Lake Louise. We sat a little while on the lawn of Chateau Lake Louise, a very large lakeside hotel, to eat a pack of Nabs before we started the return trail. After hiking up to, and halfway around, LL, we would gladly have accepted a ride down the hill. We’ve gotten soft. We had completed only 8 km and felt completely walked out. Not suprisingly, we made the return trip a little faster. It was all downhill. Our hike was 16 km (9.6 miles) round trip. 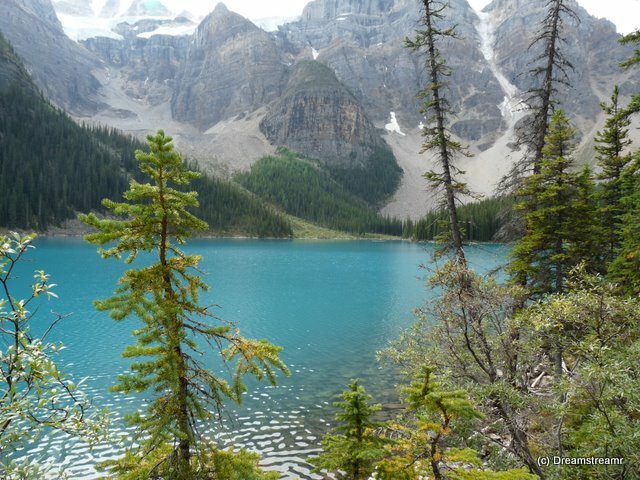 Banff National Park has numerous campgrounds, and two in Lake Louise. We decided to establish ourselves in LL for a week. This puts us nearly at the center of a lot of great sites and hiking. Our choice was simply between tent or trailer campgrounds. Lunch and meet the neighbors and we toured LL’s Samson Mall. This is a small collection of small shops, just all you need and not much more. We thought we’d do wifi (hey, other people are) then learned it is a $5 fee. Instead we’ll connect occasionally with Verizon and pay by the megabyte. Today is our first view of the Canadian Rockies and, so far, they are all they are cracked up to be. They became visible as soon as we cleared Calgary’s west side, and became more and more beautiful as the haze cleared. This was an early day for us. We previously checked and learned some sites were available in the LL campground. Instead of paying a $10 reservation fee we left Calgary at 0800 hours and, after driving 124 miles, arrived by 1100 hours. One camper was completing his check-in as we pulled up to the attended kiosk. In minutes we were registered and on our way to our site. Two hours later, on our way to tour LL’s establishments, over a dozen motorhomes, truck campers, and trailers were queued up. Sure are glad we arrived before the rush. We avoided the reservation fee, increased our chances of landing a spot, and suffered no wait for registration. Love it when a plan works. Two years ago this fall we stayed in a site adjacent to the busiest RR tracks in the U.S., in American Falls, Idaho. Every trans-American train pulled by that night, blowing her horns loudly for miles before and after. We are parked perhaps 200 meters from the Canadian Pacific Railway tracks. In our first hour we counted only three trains. And there must be a grade crossing up the tracks, because these trains are a-blowing too. Otherwise, we are in a beautiful setting over 5,000 feet above sea level. Our site is a large pull-through with 30 amp electrical service, a nice picnic table, partial shade, and washroom facilities nearby. The day is cool and dry, mostly sunny, with temperatures approaching 65 F. We bought a newspaper and cup of coffee and wrote postcards, sitting at a table outside in the LL shopping area. We drove a little to see the Lake Louise Inn and the Post Inn. Nice tourist destinations, judging from the outsides. Returning to the campground we again saw more than a 1/2 hour line-up of campers waiting to register. We bypass this and stop by the showers on our way in. As many people as are flocking to this campground the one shower facility might become very busy in a little while. Deb still waits for one of the four ladies’ shower stalls, but Jim finds two of the five men’s showers available. Also we met Neal and Michelle from Sequim, Wa, also parked nearby. They are Airstreamers, too, and touring a little while in Canada. We’ve had several chats with Neal about our RVs and modifications, backpacking in Olympic National Forest, and traveling Canada. Neal’s going to email us information about storing our rig if we tour the Washington peninsula.